MOSCOW, October 19. /TASS/. The launch pad for Soyuz rockets has been prepared for launches after the uncovered cavities under the reinforced concrete of the mobile service tower were filled, the press office of the Center for the Operation of Ground-Based Space Infrastructure said on Friday. "A special solution was injected into the cavities under the launch pad’s casing. The condition of the launch pad’s casing along the track of the mobile tower’s movement has been restored to meet the requirements of the design documentation. Now the compound has been prepared for the launch campaign. The mobile tower will move along the rail track according to schedule," the press office said. During a working trip to the Vostochny Cosmodrome, the management of the Center for the Operation of the Ground-Based Space Infrastructure inspected the launch pad and remained content with the work carried out to eliminate the voids. The work to fill the cavities was conducted ahead of schedule, the press office said. "The pace of work and the warm weather allowed carrying out the work that was scheduled for next year," the press office said. The first stage of injection works at the launch pad was completed on October 5. The first and the second portions of a special solution were injected into the cavities under the launch pad’s casing, the press office said. "The condition of the launch pad’s casing will be restored strictly in accordance with the schedule to meet the requirements of the design documentation," the Center for the Operation of the Ground-Based Space Infrastructure said. 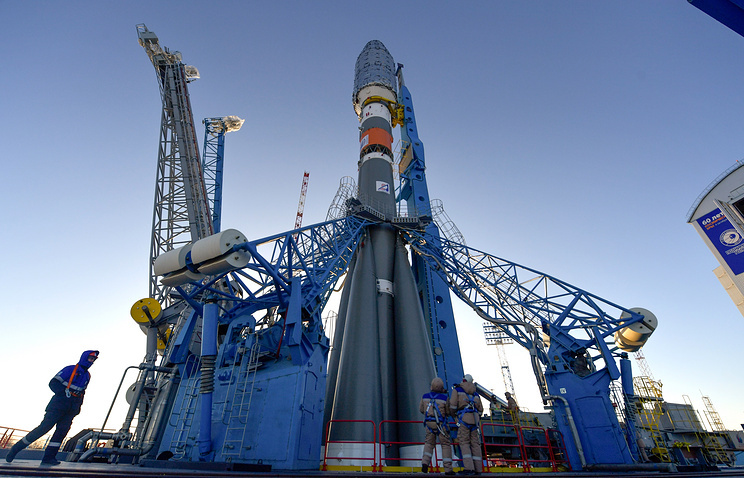 A source in the domestic space industry earlier told TASS about problems at the launch pad for Soyuz rockets. The source said that voids had emerged under the reinforced concrete foundation of the mobile service tower. According to the source, the assessment of the launch pad’s condition was carried out in July. At the same time, another source told TASS that the cavities under the compound had been found more than a year ago. A TASS source said that the facility’s previous developer (Spetsstroy) had breached the technology of concrete pouring due to hasty work. In particular, Spetsstroy carried out concrete pouring work in winter in conditions absolutely unfit for that, drying concrete with hot air blowers. The cavities in the concrete were filled by the personnel of Russia’s State Space Corporation Roscosmos before a contract was signed with Adonis company, which is carrying out repairs now. The source also told TASS that the voids without repairs could have led to the service tower’s skewness or the rail track subsidence after a certain number of launches that shake the entire building and the ground. The Center for the Operation of the Ground-Based Space Infrastructure later confirmed to TASS this information. 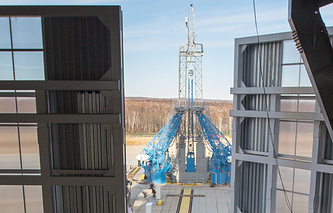 The Center said that its specialists had uncovered poor-quality concrete under a section of the launch pad’s casing at the Vostochny spaceport in the Amur Region. However, the Center said that the defect was not critical and would be removed by October 5. Meanwhile, Roscosmos told TASS that the situation was under control and the uncovered problems would be fixed and would not affect the launch campaign and the spaceport’s normal work. The Vostochny Cosmodrome is Russia’s first civilian spaceport. In April 2016, the first successful launch was carried out from the space center with the delivery of three satellites into orbit. The Vostochny spaceport will ensure Russia’s full access to outer space and reduce its dependence on Kazakhstan’s Baikonur.